A very dedicated woman spent two freezing cold nights sleeping in a cardboard box in a New York City Park in an effort to gain the trust of a 10-year-old wild dog named Charlie, or Ricky, depending on who you ask. Her devotion, along with that of many other concerned neighbors, paid off, and now he is warm and receiving the medical care and love he needs. Denise Lauffer is a dog walker who has adopted three feral dogs and a stray since she moved to the Washington Heights area in 1994. For the last several years, she’s been leaving food out for Charlie, a dog born within a pack of wild dogs that freely roamed Highbridge Park. 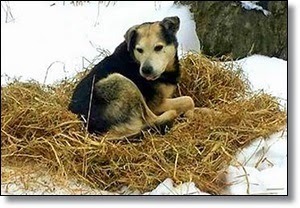 To read more on this story, click here: Woman Sleeps in Freezing NYC Park to Save Senior Feral Dog FOLLOW US!